Bruce Stronach, president of Yokohama City University (YCU) in Japan since 2004, has been named dean of Temple University, Japan Campus (TUJ), concluding an international search. The first foreign president of a Japanese public university and a respected authority on Japanese popular culture and politics, Stronach will start at TUJ on Feb. 1. 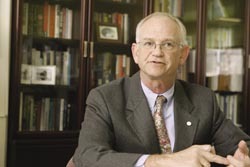 He will replace Kirk R. Patterson, who served as TUJ dean from 2002 to 2007. As per agreements reached in Japan, Stronach's official title at TUJ will be academic advisor until April 1. At YCU, an institution with an enrollment of 4,500 located in Japan’s second-largest metropolitan area, Stronach has spearheaded educational reform efforts that have made the university a model among Japanese public institutions. “Bruce brings an enormous amount of experience as an international higher education administrator and a scholar to the deanship at TUJ,” said Temple President Ann Weaver Hart. “Temple University Japan is the oldest and largest foreign university in Japan and a trendsetter in international education. Before his groundbreaking appointment as president of YCU, Stronach served as acting president (2003-04) as well as provost and chief operating officer (1998-2003) at Becker College in Worcester, Mass. From 1990 to 1997, he held faculty and administrative positions at the Graduate School of International Relations at the International University of Japan in Niigata, eventually serving as the school’s dean beginning in 1994. Stronach also has held faculty appointments at Merrimack College in North Andover, Mass., and at Keio University in Tokyo. The author or editor of dozens of books and articles — including Beyond the Rising Sun: Nationalism in Contemporary Japan, Politics East and West: A Comparison of Japanese and British Political Culture (with Curtis Martin) and Popular Culture in Japan and America — Stronach has also been a book reviewer for the Asahi Evening News. His Beyond the Rising Sun, published in 1995, is currently used to teach courses at TUJ. After graduating with a bachelor’s degree in history from Keene State College in New Hampshire in 1974, Stronach earned two master's degrees and a doctorate in international relations through graduate studies at both the Fletcher School of Law and Diplomacy and the Harvard University Graduate School of Arts and Sciences. Stronach serves as a member of the committee that evaluates the Japanese Ministry of Education’s Center of Excellence program. He is vice chairman of the board of directors of the Japanese University Accreditation Association and a past member of the Policy Planning Committee of Japan’s National Association of Public Universities. He also advises the Committee on Foreign Education Evaluation of the Beijing Municipal Academy of Education and Research. “I am truly pleased to be joining Temple University and TUJ,” said Stronach, who is proficient in Japanese and conducts YCU business in the language. “TUJ is a great academic institution with priorities that reflect President Hart’s international focus,” he said, “but as good as TUJ is now, I know we can make it better. I am committed to TUJ’s growth and the betterment of Japanese society. The timing of Stronach's arrival "couldn't be better," said Provost and Senior Vice President for Academic Affairs Lisa Staiano-Coico. "We're in the process of developing a master academic plan for Temple's future," Staiano-Coico said. "Because TUJ is a flagship in Temple's international presence, developing and incorporating TUJ's academic and facilities plans into the university's overall plans will be critical. With his experience, Bruce will be able to make immediate contributions." TUJ celebrated its 25th anniversary last year. In 2005, Japan's Ministry of Education designated TUJ the nation’s first “Foreign University, Japan Campus.” TUJ remains the only university in Japan where comprehensive programs in English for degree and non-degree students are offered and students can earn American bachelor’s, master’s and doctoral degrees without leaving Japan. Nearly 3,000 students from about 40 different countries take courses at TUJ's Azabu Hall and Mita Hall, located in Tokyo's Minato City, with which TUJ recently signed a cooperative agreement to carry out joint projects and activities. TUJ also has campuses in Osaka and Fukuoka.